This is the second view from Princes Bridge, this time looking upstream. The Melbourne Cricket Ground (MCG) takes pride of place, the lights are on for the AFL (Aussie Rules Football) game between the Carlton Blues and the Adelaide Crows. Birrarung Marr [^] is on the left, on the City side of the River, is the most recently created major park in Melbourne. The Aborginal name Birrarung Marr translates to “the banks of the river of mists”. 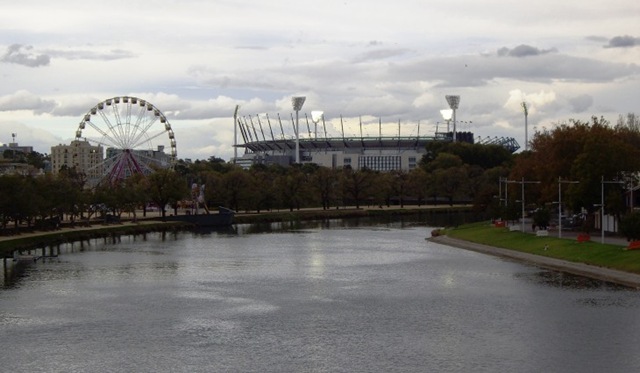 The park acts as a link between the CBD and the major sporting area of the MCG and the Rod Laver Arena, the home of Tennis Australia’s Australian Open. 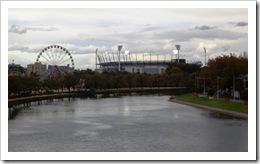 The 50 metre Ferris Wheel in Birrarung Marr is the southern hemisphere’s largest travelling Ferris Wheel [^]. A full-scale observation wheel, similar to the London Eye, is being constructed in Docklands, and is expected to open towards the end of 2008. It will be known as the Southern Star Observation Wheel [^], and will rise to 120 metres, 15 metres less than the London Eye.